This creamy Greek yogurt macaroni and cheese has all the creamy, cheesy comfort of the traditional dish but is a whole lot lighter and healthier for you! Let’s chat about everyone’s beloved mac ‘n cheese shall we? Um, it’s a freakin’ mess and a half to make. Right?! I mean, there’s grated cheese everywhere (because we all know a good mac ‘n cheese doesn’t just have one cheese in it!) including the floor which then of course means dog saliva all over my floor as well with an eager Weimaraner at my feet, a pot to boil the pasta in, a pot to make the cheesy sauce in, sometimes a baking dish if it finishes off in the oven and that assumes you haven’t had to cook any extras (like meat or something) which requires it’s own cutting board and skillet along with everything else. Every time I make it (unless it’s Annie’s and god bless Annie. Really, she’s a savior some nights) my kitchen literally looks like a tornado tore through it. I’m not sure any other meal wreaks the kind of havoc mac ‘n cheese does. Outside of his mom’s Greek food, it’s Ulysses favorite meal too so unfortunately the tornado-ized kitchen happens a bit too often. So I set out to do 2 things with this Greek yogurt macaroni and cheese recipe. 1. Lighten things up to create a recipe that doesn’t make you feel like you belong in a confessional after eating. 2. Seriously pare down on the pots and pans used to make it. With greek yogurt and goat cheese as most of the creamy factor in this recipe, I’d say #1 gets a solid A. And with 1 pot, 1 cutting board and 1 small skillet for #2, I think that’s about as good as it can get for mac ‘n cheese. Plus, it tastes out of this world and it’s got bacon. The end. Cook bacon over medium heat in a skillet until crispy, drain on a paper towel and set aside. Once boiling, add pasta and cook until al dente (about 6 minutes). Add the peas to the pasta water during the last minute of cooking. Reserve 1 cup of the pasta water and then drain the peas and pasta into a strainer. Return the pasta to the pot, add about 1/4 cup of the pasta water and all the cheeses and yogurt. Stir until all the cheese melts and coats the pasta evenly. Add more pasta water as needed. Scoop the pasta into bowls and top with the cooked bacon. Haha. I love that we have pretty much the same base recipe (the recipe I adapted mine from called for 8 ounces of cheese but I ended up using only 5). But then you went and took it and made it way fancier. ;) I’m adding bacon next time! Bacon, cheese and carbs. It’s kind of the best combination ever. Who doesn’t love Mac and Cheese? Who doesn’t love Bacon? AND who doesn’t love eating both those thing combined WHILE still wearing skinny jeans?! I love Annie’s too (I actually used her in a recipe later this week, haha!) but she doesn’t hold a candle to this mac and cheese! Looks amazing! Love the combo of peas and bacon. And healthier? I’m in. Thanks for helping us kick off this event, Gina! Mmmmmbacon. And I love that goat cheese in there! Thanks for sharing all those links. So much yum! LOL I totally feel the same way about M&C but it is totally worth it. Especially this one, YUM! Love the Greek yogurt addition!! Ohhh I like the idea of using greek yogurt in the sauce! And the goat cheese…. I sure do love my goat cheese! Gina, you are hitting me right in the mac and cheese sweet spot. Lightened up AND there’s goat cheese? We have entered my last meal territory! WOW! This looks so good! I love greek yogurt, and this seems like a perfect blend! Your blog is gorgeous! Wow, look at all those mac & cheese links! The possibilities are just endless, aren’t they? Over the weekend I had one with beef tenderloin, bell pepper and caramelized onions (nom), and now I can’t wait to try your version, especially since it’s a lighter rendition! I bet there’s a yummy tanginess from the Greek yogurt and goat cheese! I can’t believe I haven’t ever thought to add Greek yogurt to mac and cheese. I add it to everything else :) Beautiful images as always. I added a couple links myself. This look insane! I love that you used Greek yogurt. Sometimes I would have never thought to add to mac and cheese. Yum! This looks wonderful! I had never thought of using Greek yogurt in mac n cheese – what a genius idea! Will definitely be trying this soon – thank you! This is outstanding. I love that you used greek yogurt. All the taste, none of the guilt. Love the goat cheese as well. Great recipe. So easy! Pinned to enjoy later. I am going to have to try this Greek yogurt trick in mac n’ cheese. Just can’t justify the heavy cream more than like 2 times a year. And the mess – oh god, the mess! Nice mac and cheese. Thanks very much. Have a great weekend! Just made this and we loved it! The only change I made was instead of pasta I used cauliflower lightly blanched and it turned out amazing! Great day in the morning! I think I’m in love. Mac and cheese with Greek yogurt and goat cheese? Fill me up!!! 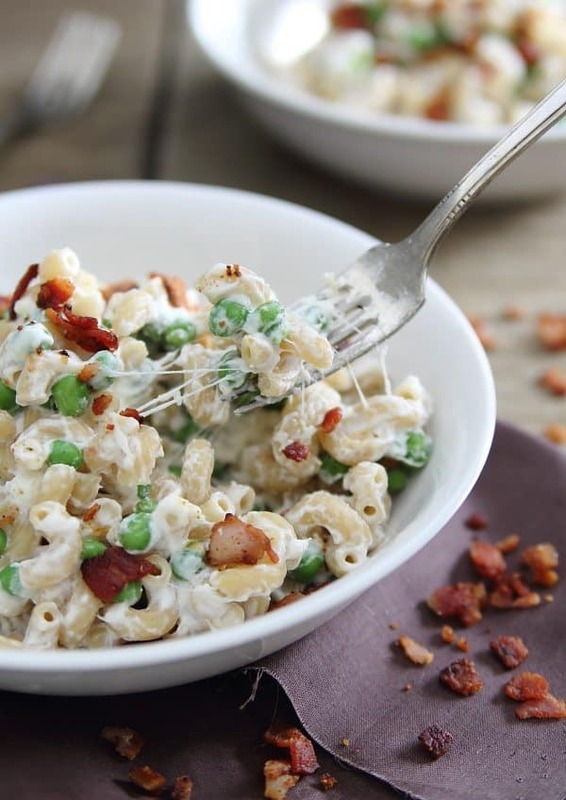 Creamy greek yogurt macaroni with peas and bacon so Instagrammable and adorable! Hope my husband would love it! Thanks for sharing! 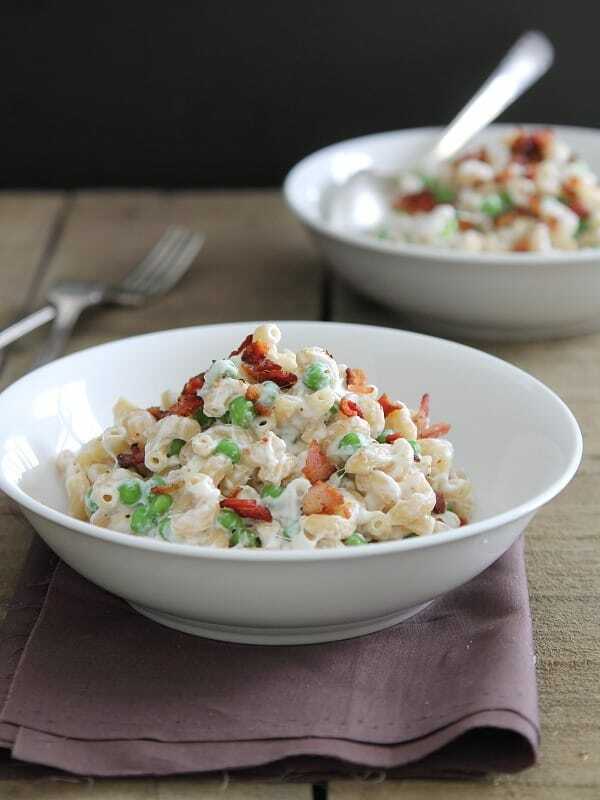 This creamy greek yogurt macaroni with peas and bacon looks absolutely fantastic. Beautiful photos, too. I look forward to trying this. 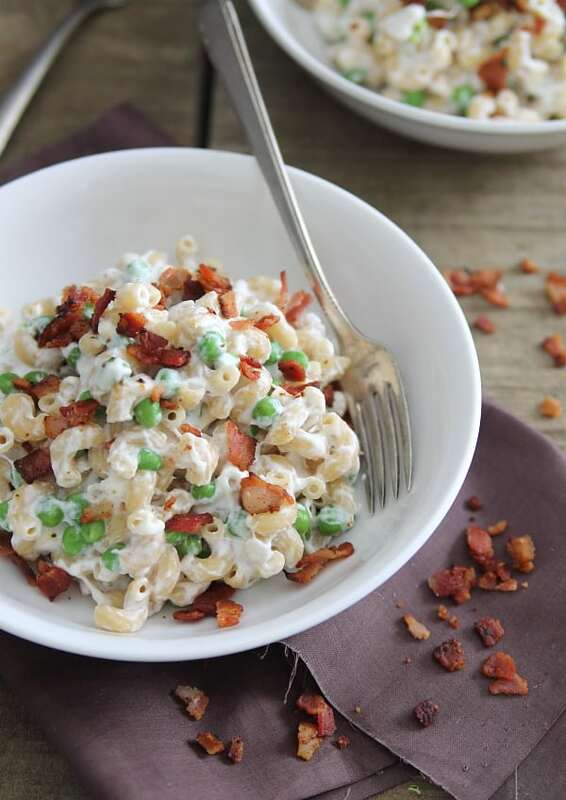 I’m ashamed to say that I’ve never had creamy Greek yogurt macaroni with peas and bacon! This recipe looks great though so hopefully that will change! Thanks for posting it, Gina!